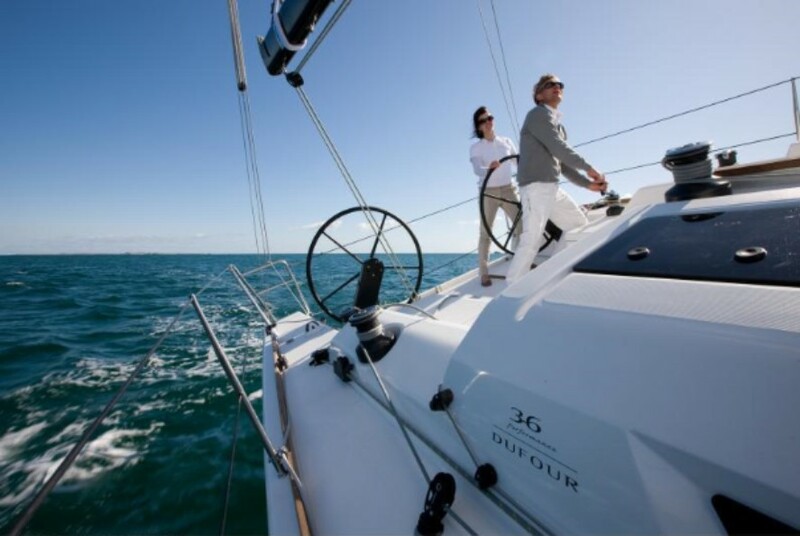 With consistent clever design throughout, the new Dufour 36 packs a ton of innovative features and is bursting with performance potential. 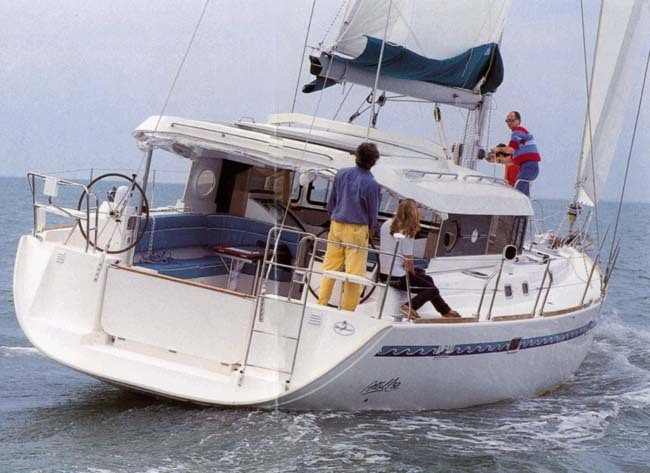 Prime examples are wide sterns and trendy hard chines, which were first developed for offshore racers, but have now been adopted even for pure cruising boats by many builders. In addition to performance, the new designs also add space and comfort below, no doubt a pleasant side effect. But now another trend is making inroads, with boats getting more voluminous in the forward sections, especially at the waterline. Again, offshore racing has been driving this development, which is especially evident in the current crop of Volvo Open 70s. For the re-launch of its performance line, the French Dufour yard has already incorporated this budding trend, as indicated by the conspicuous and unusual shape of the bow of the new Dufour 36. The nearly vertical topsides transition to a distinct U-shaped bottom and a boot top that runs in a straight line from stern to bow. All this still looks a bit unconventional because, thus far at least, a narrow, nearly concave entry has been considered fast. 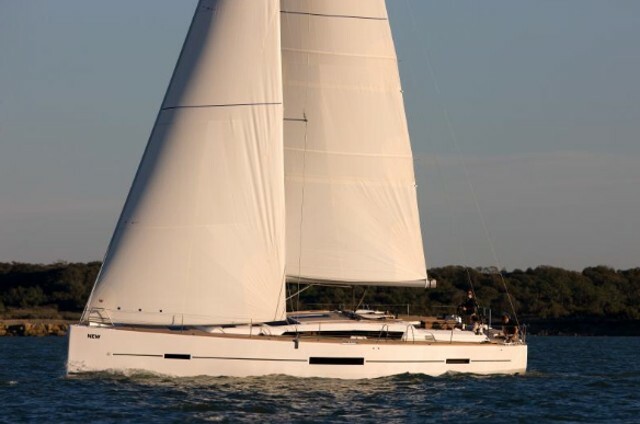 Designer Umberto Felci drew the lines of the new 36 and was on hand for YACHT’s exclusive test in La Rochelle. The goal was to concentrate buoyancy as close to the center of the vessel as possible to make full use of its entire length. As a result, the boat should remain well balanced heeling, while resistance is reduced. To achieve this, a wide stern with hard chines needs more a more voluminous bow, and vice versa. This thinking has informed the hull shape of this new model, marking a departure from previous designs in Dufour’s performance line and explaining why Dufour calls the new 36 the beginning of “a new era." Another novelty for Dufour’s sport series is the arrangement of the chainplates, which are directly attached to the hull. Previously Dufour resisted this accepted practice and retained the narrow chainplate positions with a shorter mast, but larger overlapping genoas. 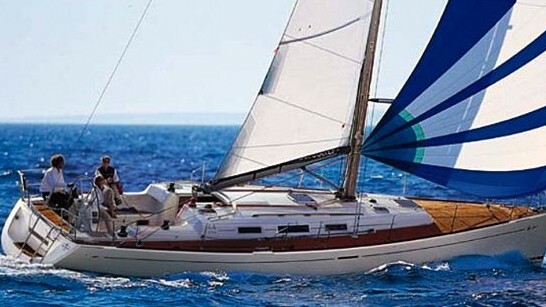 On the 36, the foot of the headsail is much shorter (114-percent overlap), which puts the mast, with its strongly angled spreaders, a bit farther aft. The greater distance between the shrouds also reduces the rig forces, which in turn simplifies and slims down the size of the necessary hull reinforcements that transfer the rig loads to the bottom of the hull. Another benefit is the significantly thinner mast profile. Felci calculated that the new rig design helps trim the weight by approximately 150 kilograms, which is a lot, considering that much of it is saved aloft, where it hurts performance the most. Still, with a displacement of 6.4 tons all up, the Dufour 36 turned out on the heavy side. Competing boats from other manufacturers in this class might be a tad shorter, but still are quite a bit lighter while retaining a similar ballast ratio. However, none of that was felt during the test sail, held in a modest breeze off La Rochelle. The 36 surprised with liveliness, was extremely agile in turns, and rapidly accelerated back up to full speed afterwards. On this boat, the helmsman only reluctantly gives up the wheel. 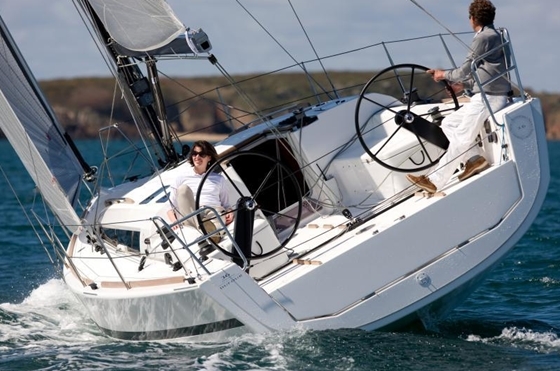 The flawlessly tuned Jefa cable steering allows sensitive steering with acute feedback from the rudder. It enables the helmsman to drive the boat to its potential upwind, which is fast and a great deal of fun, too. 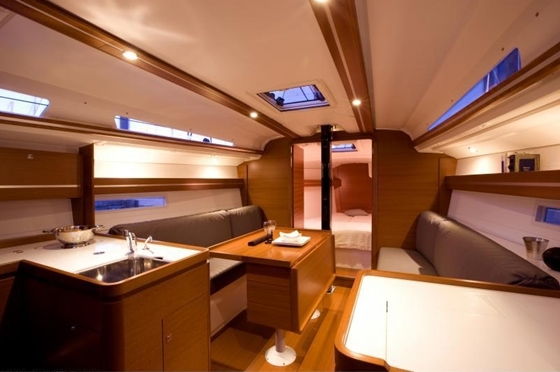 But there are more perfect workstations to enjoy, including an exemplary cockpit layout and well-placed fittings to encourage active and sporty sailing. This leaves the main trimmer as the only one with legitimate gripes. His area forward of the steering pedestal is too cramped for effective operation of the winch that trims the mainsheet, rigged in the style of German Admiral's Cup racers. The control lines for the traveler and the backstay are also difficult to handle from that spot. Ambitious racers will have to change the hardware layout in this area. At 10 knots of windspeed the speedo showed about 7 knots sailing when close-hauled. While this is good, the tacking angle of 90 degrees was not quite satisfactory: 80 degrees would be ideal for this type of boat. It did not escape notice that the tracks for the adjustment of the jib-sheeting angle were positioned far outboard, which would require the addition of barberhaulers. After our test, Dufour installed them for trial purposes and reported much-improved tacking angles with the same set of sails. The chainplate for the headstay is mounted all the way forward on the stem, which extends the J-measurement and thus powers up the genoa. However, it makes it impossible to mount the roller-furling gear belowdecks, which would benefit aesthetics and performance. An available option is the low-profile furler with belt, which was in use on the test boat and kept the tack close enough to the deck to satisfy ambitious sailors. True racers will prefer a foil forestay sans roller furling anyway. The retractable bowsprit for the masthead gennaker can be extended up to one meter forward of the stem. A pity that the trim line for the sprit has to be handled from the foredeck, not from the cockpit. A carbon pole that’s about 10 centimeters longer is also on the options list. Among the many noticeable and useful features of the Dufour 36 are the removable fiberglass cockpit storage boxes that simply sit on the cockpit floor and are attached with screws on their sides. For racing they remain on the dock to save weight and clear some welcome space in the cockpit. This is good news for the headsail trimmers, who now can work the winches more effectively while standing up. The boxes have only 100 liters of storage volume, which is plenty for small items like sheets and winch handles, but not enough for fenders or other bulky stuff. To accommodate this kind of gear, Dufour added a large storage cubby in the aft lazarette, which also would hold another sail like a gennaker and also offers good access to the steering quadrant. Rather unusual for a performance boat is the fold-down swim platform on the stern. On the Dufour 36, this platform is less a feature for taking a dip than an access ramp to the cockpit and a cover for the exemplary stowage of the life raft in the stern. For family sailing, this hatch is also available in a version that’s 20 centimeters wider, so it completely encloses the cockpit when raised -- a useful safety feature for small kids. One cabin aft, one forward, galley and nav station next to the companionway, one head, and a large lazarette aft -- this class of performance cruiser in the 35- to 36-foot range offers little variety for the interior layout, as the size hardly allows alteration in the arrangements. 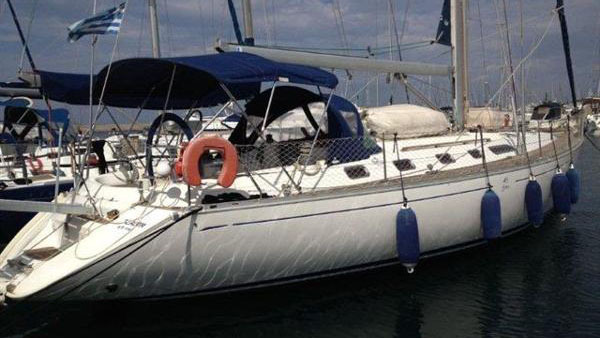 The Dufour 36 is no exception, and neatly fits the common standard. Looking at the details, however, the French surprise with several new and unusual features. The double door of the forward cabin has been tried before, but not on a Dufour. With both panels open, this door conveys a new sense of space from both the fore cabin and the saloon. Both areas merge into one, yet remain separate from each other. Another of Dufour’s slightly unusual features is the lazarette. Because of the removable cockpit boxes, this area can’t be accessed from deck. Stuff that’s stored there has to come up through the companionway. 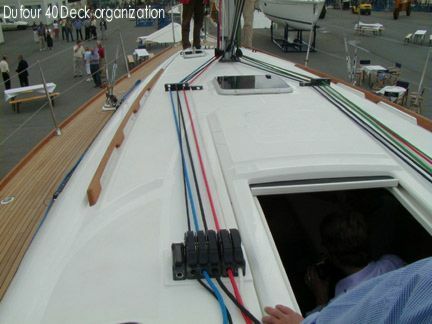 However, Dufour offers a workable alternative solution for cruisers by laminating the boxes to the cockpit floor and creating a direct access to the storage space below. The berths in the forecabin are surprisingly comfortable. They’re long enough and offer downright palatial dimensions with a width of 1.82 meters at shoulder height. Interestingly, the hard chines in the bow section put the berth rather low without giving up bunk space. As a result, it’s easier to get into bed, and the cabin feels much larger. It’s a different story in the aft cabin however, where only one adult will be able to bunk in comfort, because the engine cover narrows the shoulder space to 1.25 meters. But the settees in the saloon can double as berths if the backrests are removed, which enables a total of five adults to spend the night in comfort. The yard backs up the performance claim of the boat with many accessories that can be easily removed to save weight. It’s all small stuff, but in the end it adds up: the massive Corian covers in the galley and nav station, all doors, and the nice foldout saloon table that normally rests on two columns anchored to the floor structure with cables. Then there’s the smart idea of movable internal water ballast -- an idea that needs a little tweaking. 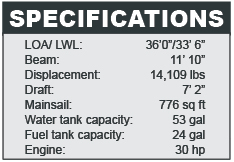 As an option, both 100-liter water tanks under the saloon berths can be connected with hoses and a pump to add more ballast to the windward side, either for increased stability or to make up for some of the rail meat that probably will be missing when the boat goes cruising with a small crew. On the test boat the whole process took an agonizing five minutes, but with a high-capacity pump and larger hose diameters it could work. 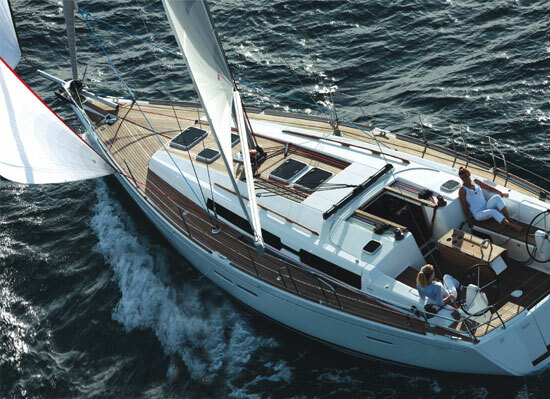 Dufour Yachts is known for its thorough hull construction with iso-polyester resins and osmosis barrier. The deck is vacuum-injected, guaranteeing strong and homogenous bonding and perfect surfaces on the inside, while eliminating the interior hull liner. Still, there was little bit of sloppiness, including untreated, raw edges and corners that took a little bit away from the boat’s overall high-quality impression. Dufour promised to take better care with the production boats. 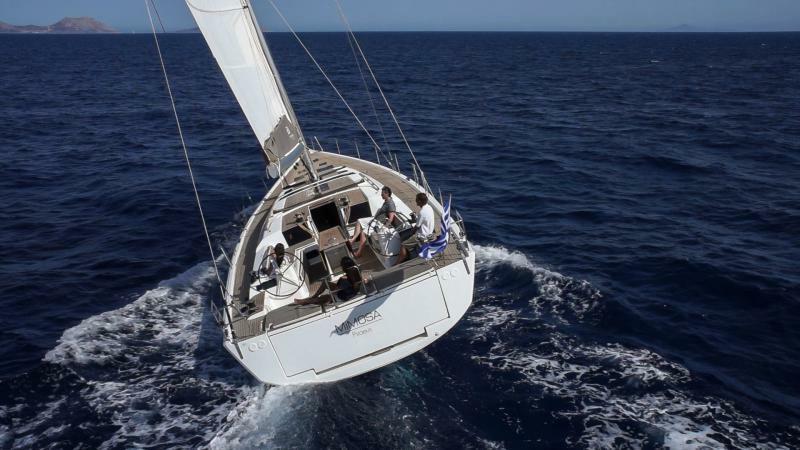 The base price without sails is 140,320 euros, a fair amount that doesn’t leave a lot of margin, but still is in the ballpark of most direct competitors. It carries a small premium, which won’t bother customers who appreciate flexibility and take pleasure in the many well thought-out details. 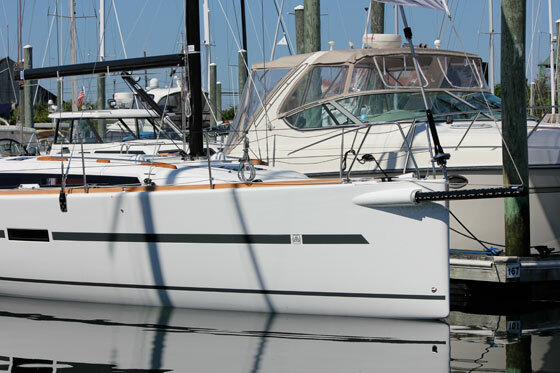 Read about the North American debut of the Dufour 36.